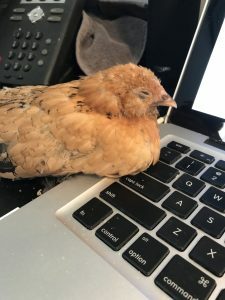 Blog Home | Backyard Chickens | Joys Of Keeping Chickens | Bring Your Chicken to Work Day! What do you do about them pooping? Hi Tom, She has a Chicken Diaper that she wears! I brought a very sick Black Austrolorp to work one day. She was near death with a respiratory infection and couldn’t lift her head to drink water. I was giving her water with a dropper. Unfortunately I was under a critical deadline at work and had to be in the office for meetings on the project, so I brought her to the office and kept her crate somewhere away from people until I could finish my meetings. She survived and my project went fine. Hi, Sheila. That is a wonderful story, thank you for sharing! 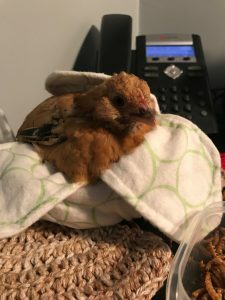 So glad your Australorp is ok! And the work project! 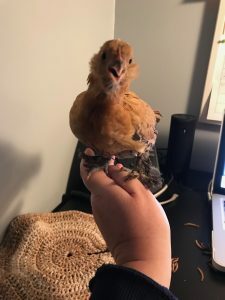 I have a bantam Mille Fleur d’Uccle that I’ve often fantasize about bringing to work. Unfortunately mine is a rooster, and I work in a library. Oh No!!! That may not work out! Those Mille Fleur d’Uccles sure are sweet little birds though! 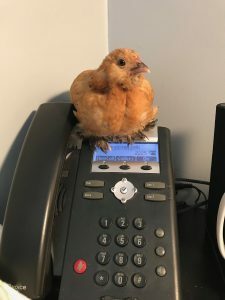 Unfortunately since I work from home, it’s more like the chickens bring ME to work each day! They have me trained to bring them treats as they’re out looking for bugs and worms in the grass and taking dust baths. I don’t think I’d get away with taking any of ours to work! Haha, such a funny thing to do! I’d love to be able to do that! I am actually very passionate about this and have my own guide on Chicken Husbandry.